My Favorite Things Blog Hop--Cuddly Style! Welcome to this leg of the My Favorite Things blog hop! You are now about two-thirds of the way done. Don't poop out on us just yet---there's a prize to be had at the end! If you've missed the first part of the hop, you better get a move on and head over to Kim's blog to take in all the sheer beauty the design team has to offer you this month and get the full effect of the hop! In case you haven't heard, there are four new stamp sets making their debut tomorrow (more details below). This one is another special charity set with $2.00 from every set sold over the next 6 months going to benefit kids with Cerebral Palsy (like Carole's son, Carter) via the non-profit Euro-Peds clinic in Pontiac, Michigan. It's appropriately named "Cuddle Up Carter" after her son. He is a such a cutie and makes wonderful strides whenever he visits this clinic. I love hearing from Carole about how well he did after their trips there and it just makes my heart burst for her every time I do. What a proud mama she is! Thank you for also supporting this cause. My Favorite Things is having a New Release Cocktail Party on Wednesday, April 1st from 9-10 PM EASTERN. Head over to the MFT forum HERE to find out all the details and to find out how YOU can be the next MFT Guest Designer. We hope to see you there on Wednesday night! I hope you like what you've seen so far. The next link in this chain is Natalie, so head on over there to see the awesomeness she is presenting! SUSIE Q-TIP: When paper piecing, run the cut out pieces through your sticker maker and then adhere them. This way, there are no small edges popping up. It also saves time. awwwww! too cute. love the peiced blanket! Very sweet! Could those papers be any cuter for this set?! Awesome job on this, Sus! Neon froggies - love them - and the DP you picked works pefectly for the background and paper piecing. He is adorable, I just love this set. oh, my cuteness! that paper is darling! lovin' the colors! Look at Ben so darling. Oh My Word! I love love love your card. I adore that button embossing folder you used (I still don't own it) and your DP and coloring are sensational. What a cute blankie too! It's been a real treat visiting your blog. lOVE IT! All that paper piecing makes for a beautifully textured card! Simply perfect! So cute!! Love those frogs! OMG! the froggies are just precious! beautiful card!! This is TOO cute, Susan - that DP is just perfect!! Super cute! Love the "frog sentiment"!! So cute - I love the blanket! I LOVE it!!!! Great card! Love the frogs!!! Ya'll are definitely rockin with the boy cards!!! Awww...Susan, this is so cute! I love the bright green frogs! I love this, Sus, so, so, so, so MUCH!!! 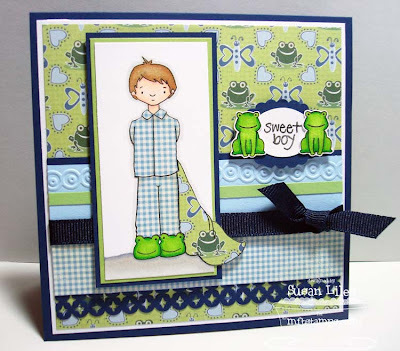 That froggie bg paper, the frog accents, those adorable gingham jammies. You have done me so, so proud with this one, sister!!! LOVE YOU, GF!!! Love all the little frogs! Real cute! super cute card! Love those little frogs!